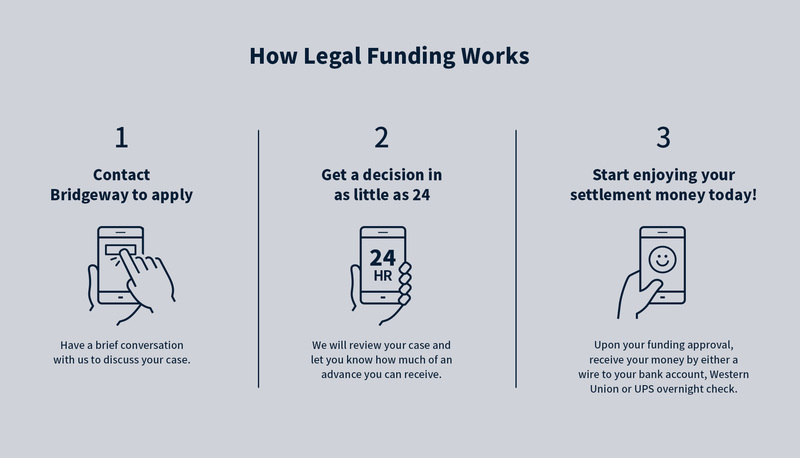 Pre-settlement funding is a cash advance for individuals that have a pending personal injury lawsuit (automobile accident, workers comp case or slip and fall, etc.) that are in need of money now. In many circumstances’ pre-settlement advances (a.k.a. "lawsuit loans") can be an incredibly valuable resource for individuals that have been involved in an accident. While the average personal injury lawsuit takes roughly 18 months, many people need money much sooner to help cover costs like living expenses, housing costs, automobile and medical expenses until they either get back to work or their lawsuit can be settled. Without the proper financial resources many individuals are forced to accept low initial offers, are pressured to go back to work earlier then they should or are unable to provide their law firms the time need to fight for the full value of their case. Pre-settlement funding is often referred to as a “lawsuit loan”, but it’s actually not a loan rather a non-recourse advance. Non-recourse means that if your case is unsuccessful, you would not have to re-pay Bridgeway anything. If there is not a settlement or award, the pre-settlement advance is yours to keep. So how does a pre-settlement advance work with Bridgeway? If you are interested in a pre-settlement advance, please call or email Bridgeway. After a short conversation with you we will then review your case to come up with an estimated value and then typically we will offer you up to 10-15% of the value of the case as a pre-settlement advance. Should you accept an advance we will send you a contract to sign electronically on either your phone or computer. We then forward your contract to your law office so that they are aware you are taking an advance. Once the contract is completed we can send you your money. We can either send you a wire transfer, Western Union or send you a check over-night via UPS. How do you determine how much of an advance I can receive? Liability: who is at fault or what percent of the accident was someone at fault. Medical - what were your injuries. What type of treatment and medical procedures were needed, what did that cost. Wage loss - can be a significant contributor. Did you have to miss work because of the accident, how much work income did you miss out on. In some cases where you are not able to return to work it is necessary to estimate what your future wage loss will be. Insurance – the value of your case is typically limited by the amount of insurance that is available to the case. For example, if you have been in a car accident the available proceeds would be limited to the insurance limits of the defendant vehicle and typically under insurance or uninsured motorist insurance that is available on the vehicle that you were in. Other – other factors can include geographic location, pre-existing injuries or accidents, future medical expenses, pain and suffering and more. Assuming Bridgeway has the information needed to review the case, you can have your advance in your hands in as little as 24 hours from contacting us. It’s your choice, you will instruct us how to send you your money. We can send it either by a wire directly into your bank checking account (fastest), Western Union (24 hours) or we can send you a check over-night via UPS. To learn more about how long the process takes and how Bridgeway gets me the money please click here: THE PROCESS. If I already have an advance with another funding company can I still get an advance with Bridgeway? Yes, in many cases Bridgeway can still help. Assuming the math works, Bridgeway would payoff or buyout what you owe the previous funding company and then provide an additional advance on top of that. For more information on buyouts please click here. Can I receive an additional advance later if I need it? Yes. Bridgeway is typically willing to review cases for an additional advance 90 days after the last advance. If the math works and there is room we can make additional advances. For Bridgeway’s complete guide to pre-settlement funding client here: THE GUIDE TO FUNDING.